Isolated severe thunderstorms spawn an EF1 tornado in Verona and McFarland. The storms transition into a bow echo and travel east across southern Wisconsin. Today was your typical June severe weather day across Wisconsin. Instability was strong with the presence of steep mid level lapse rates along with a decent cold front to provide convergence for storms to develop. However, 0-6 km and 0-1 km wind shear was forecast to be weak so the threat of tornadoes was low. We weren't optimistic but we always seem to learn something new no matter how much meteorology knowledgeable you have or how many years you've been out storm chasing. Our target was Madison, Wisconsin as a middle point for possible storm initiation in the fox valley region and further southwest near Dubuque, Iowa. The models were hinting at storms firing across eastern Iowa for most of the day, so Madison was the place to sit and wait. Around 4:00 p.m. a storm rapidly blew up near Fennimore, Wisconsin in Grant County. We tracked west along highway 18/151 to meet up with this rapidly intensifying storm. The 0-6 km shear was very marginal and assumed these storms would become outflow dominant. James and I reached Dodgeville, Wisconsin and found a dirt road to view the storm to our northwest. Continuous thunder was heard above in the anvil tops indicating intense intra-cloud lightning was occurring. As the storm matured, the updraft base had developed a wall cloud to our northwest. It appeared to be a shelf cloud, but after 15 minutes it was isolated and appeared to rotate very slowly. A tornado didn't seem imminent but the velocity data on radar from NWS La Crosse indicated a broad rotation so this confirmed on what we were seeing. The storm developed striations at its mid levels around the updraft. This type of representation is indicative of rotation within the storm. The wall cloud moved east and decided to keep up with it. The storm continued to be severe with a decent hail core to its north. More storms were now congealing into a line behind the one we were following which was expected today. We caught up and drove underneath the wall cloud on highway 18/151 near Blue Mounds, Wisconsin. It was very low to the ground, but the rotation was practically none to very broad at best so the tornado threat was low. We reached Dane County (35 miles west of Madison) and traveled south on highway 78 to view the storm as it was changing structure. The wall cloud|lowering was to our north and a forming shelf cloud was directly west from the storms starting to bow out towards us. We headed east on highway A in southern Dane County to stay out ahead of the storms but to no avail we had a hard time as the storms were becoming a full fledged Bow Echo across Southern Wisconsin. The outflow|gust front kicked up dirt and produced mini-gustnadoes but nothing too significant. 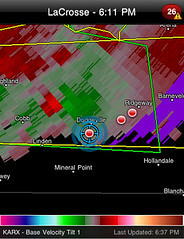 The storm we had been tracking back into Iowa County through Dane County had become tornadic as the National Weather Service (NWS) had issued a tornado warning. The circulation was about 3 to 4 miles north of us, near Verona but it was becoming very hard to visually see the wall cloud or any rotation. The loss of daylight and heavy precipitation was obscuring our view. The gust front had moved east of us but the leading edge of the rain was now upon us and we decided to take shelter behind a garage type structure to let the bow echo overtake us. We decided to call off the storm chase and head for home. There were many damaged tree branches and limbs through Albion, Wisconsin in southeast Dane County on our journey back. The NWS was mentioning winds up to 100 mph in their severe thunderstorm warning text, but thankfully those winds weren't transported to the ground. 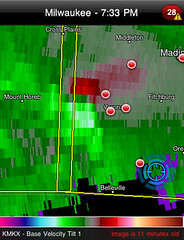 An EF1 tornado was confirmed near Verona, Wisconsin and traveled northeast through McFarland. The tornado caused major tree and roof damage to shingles along its path.